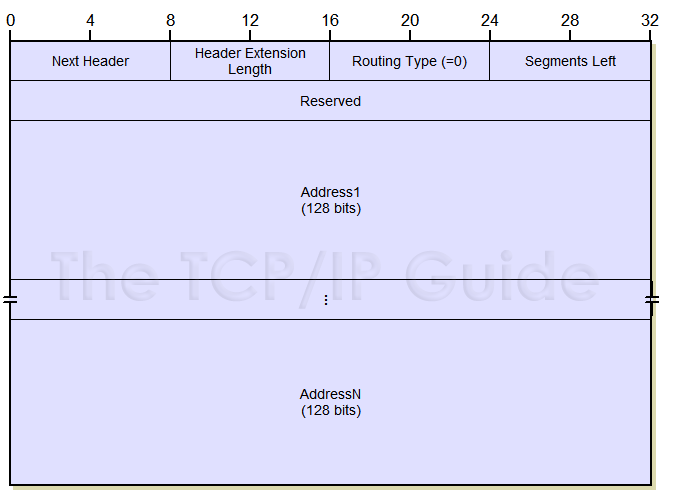 The Routing extension header is used to perform source routing in IPv6. It is described in Table 71, and illustrated in Figure 107. Next Header: Contains the protocol number of the next header after the Routing header. Used to link headers together as described above. Header Extension Length: The length of the Routing header in 8-byte units, not including the first 8 bytes of the header. For a Routing Type of 0, this value is thus two times the number addresses embedded in the header. Routing Type: This field allows multiple routing types to be defined; at present, the only value used is 0. Segments Left: Specifies the number of explicitly-named nodes remaining in the route until the destination. Addresses: A set of IPv6 addresses that specify the route to be used.